Disclosure: We may earn commission from some of the links in this post at no cost to you. Read our T&C’s for more info. Not sure what special first baby toys to buy? It’s so tricky to know what toys a baby in the 0-6 month age range might enjoy, especially when you’re are a first time parent or first time grandparent. There are so many toys out there that you think a baby might like but when presented to said baby they are simply not interested in them or only play with them for a short time. You can avoid that kind of disappointment by choosing the recommended special baby toys on this page. Luckily for you I’ve been parenting and caring for families with babies for over 26 years so I have a REALLY good idea of the kinds of toys babies love. 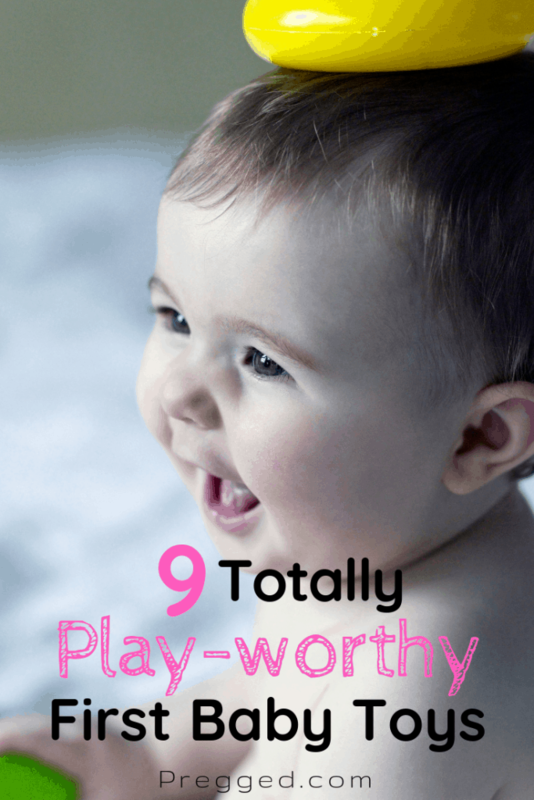 The following 9 baby toys are all ones that your baby will enjoy for many months and years to come. The peek-a-boo bear is a lovely first gift for your baby. 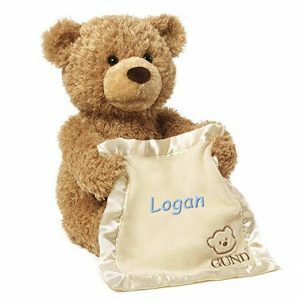 Not only will your bay have hours of fun playing with the bear it can also be personalized with baby’s name too. Press the bear’s foot and he will start playing babies favorite game – peek-a-boo. This toy is sure to get those baby giggles going. 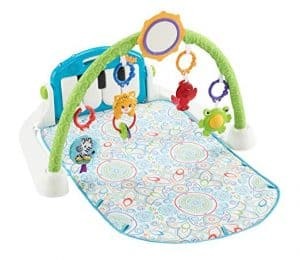 Every baby needs a play gym and you will get months of playtime out of this toy. Baby gym is the right word for because it will help develop and strengthen all of babies muscles. From birth they will enjoy gazing at the objects above them. As their arms get stronger they love batting the hanging parts around all over the place! From about 4 months, it will encourage them to turn and in time to roll over. From 6 months your baby will be able to sit and play with it. And from 8 months she will be trying to pull herself up on it. A real must have that has tonnes of longevity. Here’s another great toy idea for the younger babies. A simple bundle of toys that will give your baby loads of enjoyment for the coming months. 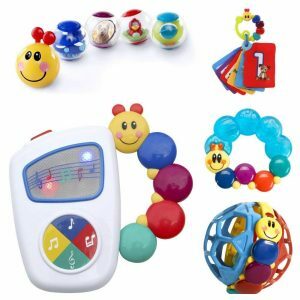 You get a rattle, a teether, fun balls, music carry along toy and number cards. Your young baby is going to love exploring these toys with his or her hands and mouth. They will also improve your baby’s fine and gross motor skills as they manipulate the toys in their hands. Your baby will (probably) love a Jack-in-the-box from about 2 months of age. I say probably because it’s impossible to predict their first reaction to seeing Jack, or in this case good ole Santa, popping out. Some sensitive ones may find it a little scary. 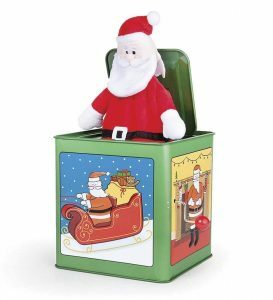 My own experience is that most babies love surprises and a jack-in-the-box tends to make them laugh far more often that frighten them. It’s also one of those toys that is going to provide a whole variety of learning experiences as your baby grows. They will be enjoying this right up to 1 year old or longer so you will definitely get your money’s worth from this one. Another truly inspired toy for baby. Every baby loves to kick and this toy will get your baby giggling and having fun. Your baby is going to get hours of enjoyment out of this toy from around 2 months old. 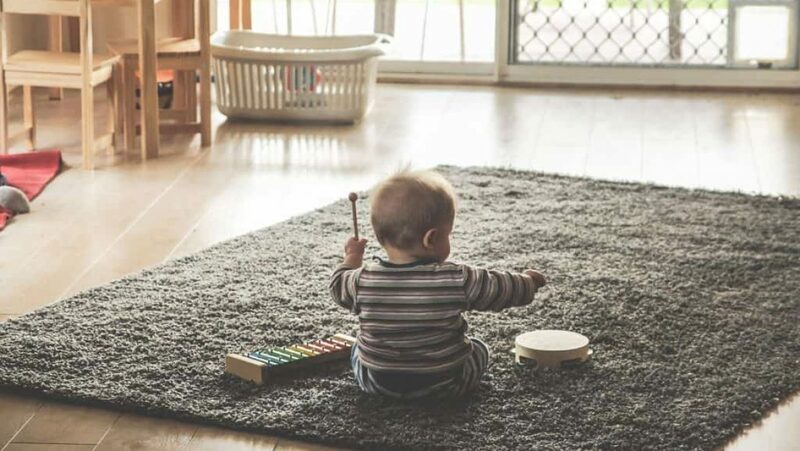 Placed on the floor against a sofa or at the end of the crib, your baby can gain control of her leg muscles and make music at the same time. They’ll delight at their ability to make their feet create music. 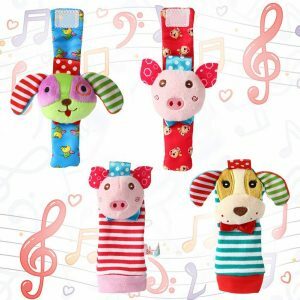 These wrist and feet rattles are fabulous. 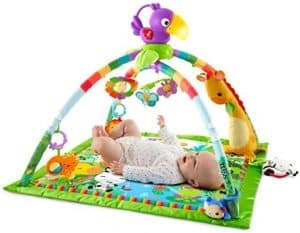 Brilliant as a baby’s first toy and suitable from birth onwards, they encourage muscular development of the arms and legs and hand to eye coordination. When a baby is first born they have absolutely no control over their leg or arm muscles. 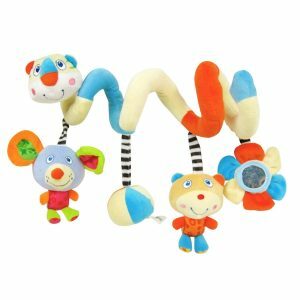 The rattles help them learn to guide their feet and hands towards their mouths. They delight in learning how to control their own movements. 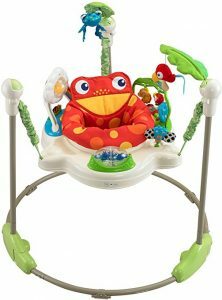 This is another brilliant toy that your baby will enjoy form birth onwards. With so many different colors, textures and sounds it will keep them entertained for a long time. A great toy to take with you wherever you go. You will find your baby will play with these kinds of toys for months. At first they will shake it, then start exploring each bit with their mouths, hard parts will be a delight for soothing teething pain, then it will help develop their gross motor skills as they learn to manipulate the toy with their hands, and then they will get interested in the details of the toy and start developing their fine motor skills. Every baby needs a mirror and it should be one of the very first toys you buy. From birth onwards, babies just love looking at themselves in the mirror. Your baby will learn a great deal about facial expressions and start to get an idea of what they mean which is essential for their social development. 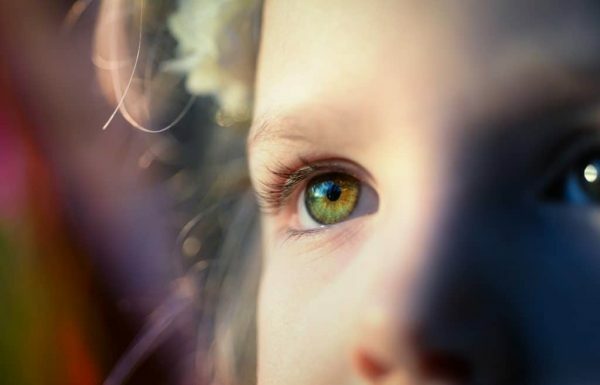 It will fascinate them for hours and over time it will help them differentiate between self and others. This one is hours and hours of fun and it even allows you go the bathroom without a baby in tow now and again. Once your baby can hold his head up confidently on his own he’s going to love bouncing and exercising those leg muscles. This toy will also strengthen his back muscles. But don’t be tempted to put your baby in a bouncer before they are at least 4 months old no matter how much fun it looks! You could damage your babies neck and back muscles. What Makes a Good Baby Toy? 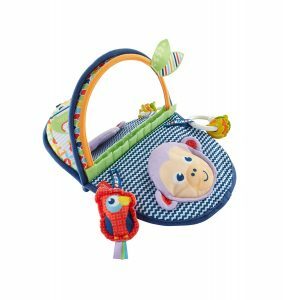 If you’re looking for a first toy for a newborn or infant and don’t have any children yourself, it’s particularly hard to know what kinds of toys a newborn baby will enjoy and what to choose from the myriad of baby toys and gifts available. Baby play is such an important part of their development so choosing toys that are going to stimulate them mentally, physically and emotionally is important too. I hope you’ve got some really good ideas for toys for baby’s first toys and that baby loves whatever you buy for them.